A big part of a horror movie's appeal isn't just that people die — it's that that they die in excruciating, terrifying, stomach-churning ways that'll keep you awake for weeks. But these horror movies killed off their characters in such ludicrous, unbelievable ways that your tears of fear will be replaced with tears of joy and wonderment. In the context of the movie, Deadly Friend's silliest death actually makes sense. The murderer is possessed by a robot that the old lady (Mama Fratelli from The Goonies, in the role of a lifetime) hated with a passion. Earlier, the robot accidentally threw a basketball into Mama's yard, and she kept it because she's a grouchy meanie. So naturally, when it came time for the robot to get revenge, it did so with the basketball. Just because you're mechanical doesn't mean irony has to go out the window. But the way they pulled this scene off couldn't have been any dumber. First, Fratelli gets thrown to a wall and turns around to see the robot holding the basketball. Instead of doing any normal, human things like moving, Fratelli screams nonstop and holds her head very still. She doesn't attempt to duck or block the shot — not that doing so would've made it any better, as the robotic microchip inside the girl's brain has magically given her super-strength. She flings the basketball with the force of a thousand cannons, exploding Fratelli's head on impact. It's the head-go-boom scene from Scanners, only even dumber. Then it gets sillier. Fratelli's headless body stumbles around, making gurgling sounds from the mouth and throat it no longer has, while her hip seems to dislocate itself in incredible ways. After a few seconds, Fratelli finally drops dead, as does her hip. Maybe she was feeling the effects of severe appendicitis? If so, thankfully she didn't have to suffer through it. Rabbits are so darned adorable, any effort to make them scary falls flat on its face. Monty Python got away with it, but only because they made the idea exactly what it is: absolutely ridiculous. Night of the Lepus took scary bunnies seriously, and the result was as absurd as you'd expect, especially since they didn't make the rabbits look scary at all. They're just fluffy widdle wabbits made gigantic with clever camera angles. Even when the rabbits do kill somebody, it's more precious than terrifying. Take the above scene, where dozens of rabbits invade a farm — the middle-aged farmer tries to run away but trips, like a token meatbag running from the killer in a real horror movie. The rabbits make lion-like gurgle-roar sounds as they descend on the poor farmer, ripping his throat out and leaving him for dead. It's not all that gory, but the fact that this man died via growling bunny stampede makes his death immortal in ways the director almost certainly never intended. That said, some of the rabbit deaths might be even dumber. Post-throat-rip, the rabbits scamper off whinnying like horses after another farmer shoots at them. They then go after Farmer Two, who retreats into a storm cellar and begins shooting the varmints dead with the storm cellar door still closed because why not at this point. Hellraiser, like many horror franchises that refuse to go away, started out legitimately scary but got real corny, real fast. Nowhere is this more evident than in Hellraiser 3, when Pinhead invades a young-n-hip nightclub and turns everything inside against the party people. Wall decor turns deadly, a woman's drink solidifies into a missile that impales her through the mouth, and then we have this. In the ultimate example of dancing 'til you're dead, a DJ is standing around his gear, seemingly oblivious to the horror around him until his own CDs come to life and start whirring around his head. As he stares at them like this was the coolest magic trick he'd ever seen, they fly at him one-by one and impale him. One goes into his skull, two onto either side of his face, two more hit his brain and causes his head to explode with blood, while one straggler shoots out of the CD player and right into his mouth. This final disc gives him quite the Glasgow Smile as he finally drops dead, much to the delight of both Pinhead and viewers who enjoy recreating Mystery Science Theater 3000 in their own homes. The next time people ask why nobody buys CDs anymore, show them this scene. They'll understand. Much has been made out of Silent Night Deadly Night 2's "Garbage Day!" scene/meme, but that was just one bullet from a gun. 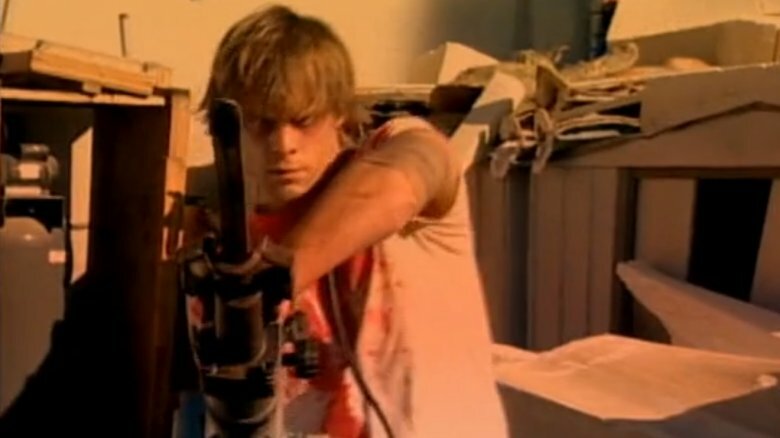 There's actually a much stupider death earlier in the film, the one that kick-starts young Ricky's asinine murder spree. A smug jock named Chip starts causing trouble, throwing Ricky to the ground and harassing his girlfriend Jennifer, whom Chip used to date. Instead of walking away, calling the cops, or simply shooting the guy while yelling "Date night!" or something equally memeable, he chose to grab Chip by the throat, push him against a car, and treat his mouth like a car battery. 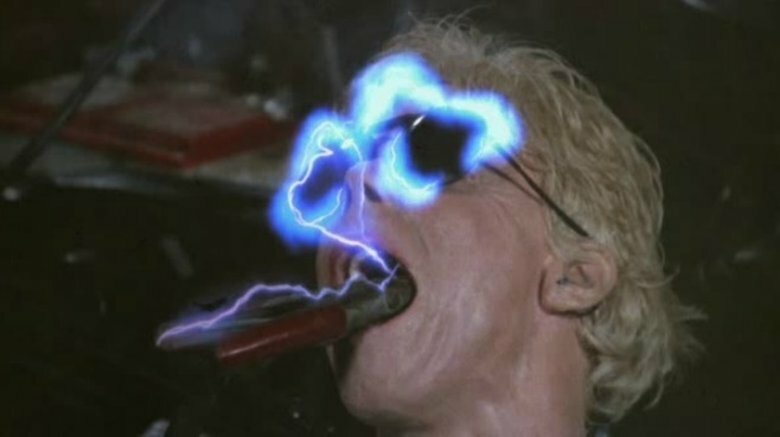 Yep, he attaches the positive end of his jumper cables to Chip's teeth (thanks to Chip stupidly keeping his mouth wide open and holding very still for him), turns up the juice, and electrocutes poor Chip until his ugly sunglasses explode. Jennifer screams at him for killing a man, never bothering to confront him with the most obvious question: why clamp the cable to Chip's teeth? The human body is pretty conductive all over — we're mostly water, after all. You don't see criminals in the electric chair eating a cable, do you? This is why people laugh at you right before you kill them, Ricky. This death may look like it's NSFW, but in reality it's not safe for functioning brain cells, at work or at home. After being injected with a supposedly lethal combo of drugs by drug dealers he owes money to, Jack turns psychotic and goes after his would-be killers. He grabs a jackhammer (which is really clever writing because his name is also Jack), finds the nearest drug dealer, and goes to work on murdering him. As the dealer turns around after fixing a stereo player, Jack turns on the Himhammer and shoves it right into his victim's mouth. Then, he gets to jackhammering, drilling further and further to the back of the skull, all while grinning the dopiest grin a killer ever did grin. That alone would be goofy enough, but he just keeps drilling. Eventually, he's drilled so far that the body of the hammer is impaling the drug dealer's now completely split-open face because the human body is exactly like a pile of old concrete. Any possible Freudian undertones of a jackhammer-in-the-mouth scene (and there are many) are quickly forgotten because of how dumb the whole thing looks. At least the guy's head didn't explode into thousands of chunky gore-bits like so many other cheesy horror flicks. This suggests they wanted us to take this death seriously, which may be the funniest part of all. Horror films usually don't kill children, perhaps because seeing a pure innocent die terribly makes too many people squeamish. So when a movie does kill a kid, it better count. Dinocroc did not do that. The eponymous Dinocroc is a dinosaur/crocodile mishmash (surprise!). It also apparently has a taste for the wee ones. In the scene above, it chases a boy named Michael all through the forest, finally cornering him in a boathouse of some sort. The chase is definitely thrilling, with enough crashing noises and shaky cam to satisfy dozens of Jason Bourne movies. But then Dinocroc catches the boy and eats him, complete with perhaps the cheesiest special effect in the whole movie. Dinocroc chomps Michael's body whole, sending his head flying through the air and to the floor while a spooky chorus sings spookily in the back. Even by horror movie standards, Dinocroc has no sense of subtlety. If Dinocroc didn't use the worst CGI available to create the severed head and gory-yet-conveniently-tidy neck, maybe this scene would've worked. As it stands, the thrill of the chase, and Michael's final word heartbreakingly being "Tom," his beloved older brother, gets irrevocably tainted by sub-amateur computer effects and melodramatic Latin choral music. On the plus side, the film had a dog and he survived. 2006's Slither was a weird little movie about a guy named Grant who's controlled by an alien parasite, who turns everyone in the town into an extension of him. Either that or they die horribly, like this poor boy. This is some super-minor character (IMDB says his name is Charlie, but it hardly matters — he could be anybody) who confronts Grant, now a full-fledged tentacle monster, about finding one of the town's few surviving girls. Grant responds by whipping him with a tentacle. This one slap somehow manages to split Charlie in half vertically, an extra-large papercut that grows and grows until it opens up completely. It's such a deep cut, in fact, that it cuts clear to the organs, spilling his guts and assorted viscera all over the place. No Band-Aid was going to fix that. Silence of the Lambs is one of the creepiest movies ever made. Its sequels and prequels, meanwhile, are varying shades of less so. Nowhere is this more evident than in the brain-eating scene of Hannibal. In it, Paul Krendler — the assistant attorney general desperate to advance his career by capturing Hannibal Lecter before Clarice can — gets captured by Hannibal then is drugged and scalped so Hannibal can get to the brain. Now, if the scene just stopped there, it'd pass easily. He's a cannibal, right? So of course he'd want to eat some guy's brains. And in the Hannibal novel, he did just that, even forcing a bound Clarice to eat them as well. But the movie went about a thousand steps further. See, Hannibal didn't eat Paul's brains — Paul ate Paul's brains! Lecter picked out big chunks, cooked them up (eating raw brains might be unhealthy), and then fed them to Paul like a baby. Paul even remarked how tasty they were, just in case it wasn't clear that this scene was being brought to you by the letters W, T, and F. Clarice acted disgusted and mortified, but the typical audience reaction was more likely akin to, "really?" Krendler, obviously, dies from lack of brain, but at least he didn't die hungry. The "glass-pane death" in Final Destination 2 is proof that even the most basic death scenes can lose their thrill if the filmmakers have no idea what death looks like. In this scene, a kid named Tim is leaving the dentist, only to find a flock pigeons milling about. Despite pigeons being perhaps the most boring and easily ignored birds in existence, Tim gleefully chases after the pigeons to stir them up. This places him right under a giant pane of glass, which falls after the guy at the controls hits the wrong switch because he has a faceful of pigeon. The glass hits Tim and kills him, and everybody's very sad and scared. Here's the issue — if you watch the clip of his death, you'll see perhaps the funniest-looking way anyone ever died after getting beaned with something heavy. Instead of breaking his neck or fracturing his skull, Tim seems to explode. His innards burst out his abdomen, and his entire body disintegrates like a gory old building turned to bloody rubble. Obviously, it's a supernatural horror film and thus not totally realistic, but Tim's death wasn't even close. You can absolutely die from getting crushed by super-heavy glass falling from high up, but would it really make your body look like a curb-stomped pumpkin?